Racing is to summer what lip liner is to Kylie Jenner. You can't have one without the other. Thankfully, the coming months are jam-packed with fabulous racedays at Ellerslie Racecourse, for everyone to enjoy. 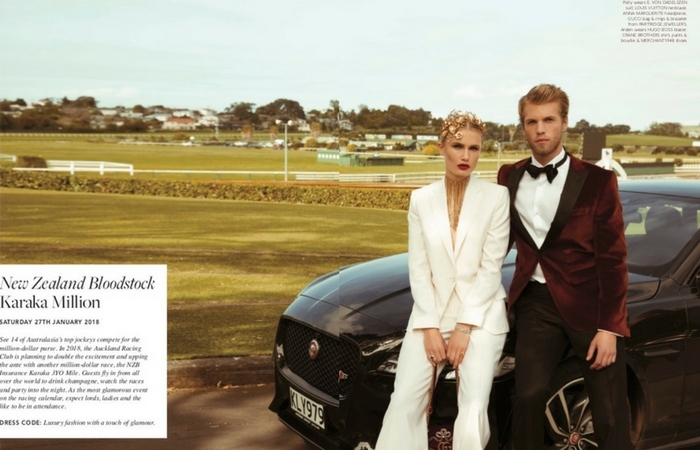 To celebrate the summer of racing, we headed to Ellerslie Racecourse with our models, a Jaguar and a horse in tow. The result: a stunning styled shoot to inspire you for all of the soirees ahead. 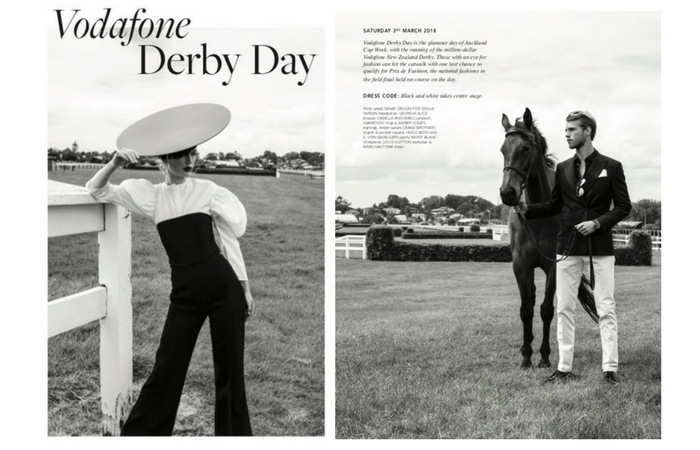 From the glamour of Vodafone Derby Day to the colour of the Christmas Carnival, we've got your raceday look covered. We've also compiled our must do racing events on the summer calendar, so get your best raceday dress on, pop a headpiece in your hair and we'll see you there! The Boxing Day Races are an institution on Auckland's summer social calendar. Running for 160 years, this event is all about a day in the sun with high fashion, entertainment and premier thoroughbred racing. 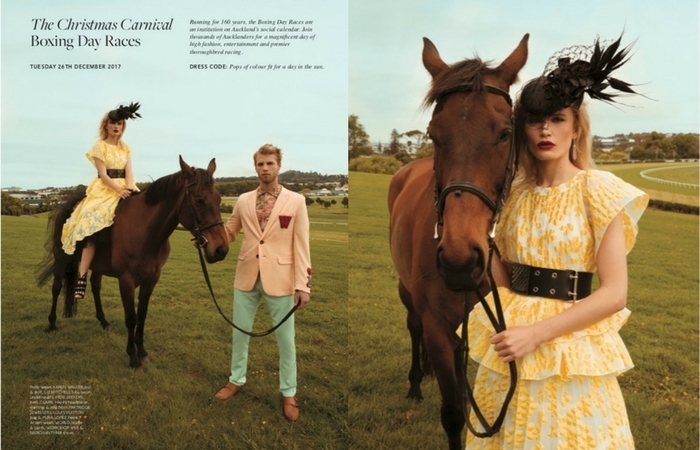 Make sure you're dressed in colour, apt for a summer's day at the track. Tuesday 26th December 2017. Feel the excitement of watching 14 of Australasia's top jockeys compete for the million-dollar purse. To up the ante on an already exciting event, Auckland Racing Club is this year planning to add another million-dollar race, the Karaka Million 3YO Classic. You'll spend the late afternoon drinking champagne and watching the races amidst lords and ladies, before partying into the night. This highly anticipated event calls for luxurious fashion with a touch of glamour. Saturday 27th January 2017. This is the most glamorous day of Auckland Cup Week, with the running of the million-dollar Vodafone New Zealand Derby. Feeling fashionably inclined? Hit the catwalk for your last chance to qualify for Prix de Fashion - the national fashions in the field final held that day. Follow the 'black and white' dress code and enjoy a day of glamour. Saturday 3rd March 2018. This is one of New Zealand racing’s most prestigious days out. Enjoy a day in the sun and celebrate Auckland’s iconic 'Cup' race. Dress to the nines (Hawaiian Airlines are rewarding the best dressed ladies...hint hint!) and incorporate a touch of blue into your ensemble for this massive farewell to the summer of racing. Saturday 10th March 2018. For more information about these fabulous racing events, head over to Auckland Racing Club. Kylie Jenner makes the cover of Forbes Magazine! Is this Australasia's most stylish event ever?